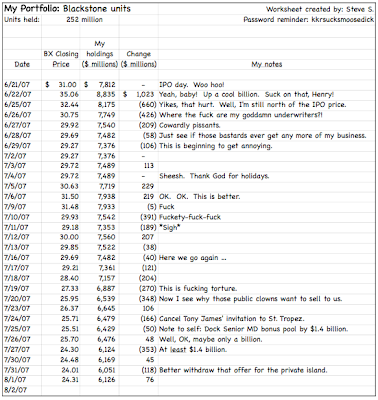 Ever since the Blackstone IPO, I have been curious to know how Steve Schwarzman and his fellow PE-tocrats over at The Blackstone Group have been handling the experience of being a public company. After all, even though they have a lot of experience taking portfolio companies on round trips to and from the public markets, this is the first time in years that many of them have been subject to daily report cards on their business from Mr. Market, not to mention real time updates on a major portion of their personal wealth. Well, thanks to my talent for suborning disgruntled junior PE professionals, I can now report on the reactions of at least one altitudinally challenged squillionaire. It appears that Mr. Schwarzman has been taking time almost every day—even while on a less-than-satisfying French vacation—to record his reactions to the daily ups and downs of BX stock. No wonder, since for every penny BX shares move his personal net worth goes up or down by $2.5 million. My mole inside has forwarded a screen shot of the personal worksheet Steve has been updating, which I attach below for your viewing pleasure (click for a closer view). Who knew that ol' Steve still knew how to use Excel?